Extreme weather conditions are a common occurrence in Atlanta. And if you have trees in your yard, the more you need to pay attention to possible damages left behind by storm events. Hurricanes, severe thunderstorms, flooding, hail, and tornados can take a toll not only on your trees but also on your landscape. It’s crucial to prepare ahead of time and respond as quickly as possible after the storm. Here are common storm events in Atlanta and potential tree damages they can cause. Severe storm. Strong winds can result in twisted or broken branches. In extreme cases, a tree can also be downed or uprooted altogether. 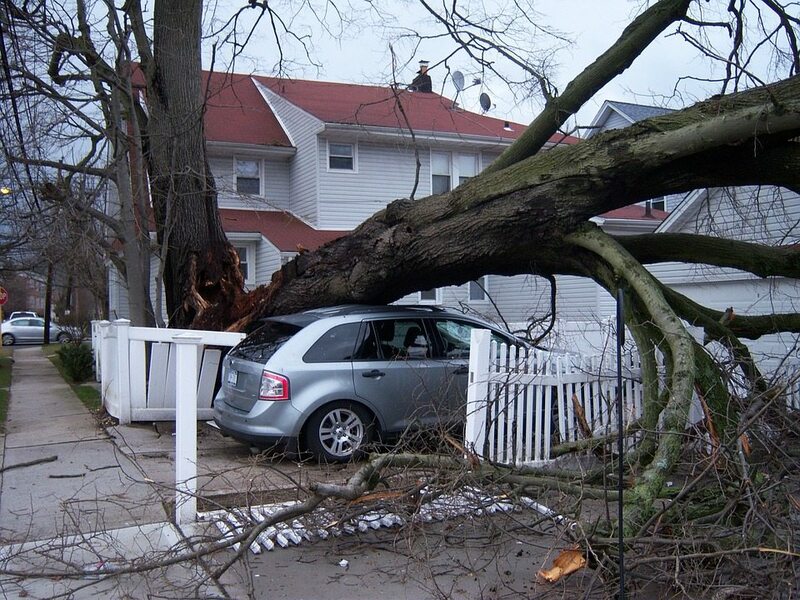 Some trees may hold up better while some may incur more severe damages. Trees with healthy root systems are more likely to survive. However, since these trees may have already suffered from stress, they may not be able to last long should another storm hit your area again. Heavy flooding. Low-lying areas are likely to take the brunt should flooding occur. Flood can sweep away soil that supports a tree’s root system. Flood water may also carry in them toxins that are harmful to your trees. The capacity of your tree to endure flooding depends on several factors such as its height and age. Once the flood recedes, it’s best to contact a tree service company in Metro Atlanta to further assess the condition of your trees. Hail. Branches may fall off when thick ice starts to cover them. Aside from the weight of the ice, other factors, such as the wind, can leave branches weak. Old trees and those with brittle or weak wood are usually more prone to damage as they’re less flexible. Depending on the damage your trees have incurred, recovery may take some time. It’s understandable for homeowners to feel the urge to handle the storm clean up themselves, particularly if there’s tree debris left. But before you get started, assess first the extent of the damage. Here are more tips worth taking note of. Look into your family and home’s safety first, above anything else. Next, assess your neighborhood as well whether it’s safe to start working on your yard. Should there be fallen trees that block roadways, contact local officials immediately. Respondents will take care of the downed trees so the road can be used again. In case you can’t reach state offices, call for professional help from a tree service company in Atlanta. It pays to hire a team that is based locally so they can get to you in no time. Get in touch with your insurance providers if there are any damages to your properties. Notify them of the incident so you can be provided instructions regarding filing claims. Keep all tree debris you’ve gathered organized. Separate those that can still be recycled. Pile the others properly so they won’t limit the mobility of tree workers or your neighbors. Only handle minor tree work. Be very careful when working with downed trees as their branches have the tendency to snap. If the tree branches, trunks, or limbs are too heavy to carry, let tree workers remove them. If you deem the use of chainsaw or any tree removal equipment is necessary, it’s best to let tree care experts do the job for you. They’re equipped with safety gears and are fully experienced when it comes to storm cleanup involving trees. Look for a certified arborist to assess the damage to your trees. They can take care of tree debris removal, full tree removal, or saving of trees. It will make you feel at ease to know that a Certified Arborist is among the tree service professionals working in your property. You’ll know that the team knows exactly what to do and will make sure to do it right, the first time. At North Star Tree Service, we offer emergency tree services, before and after storm events, across Metro Atlanta. We make sure to use techniques that will help reduce damages to your property. And should you need assistance in initiating claims you may be eligible for, we also have insurance claims specialists on board to help you. Call us at (678) 562-1068. We’ll get the tree work done safely, effectively, and as quickly as possible.